Yumiko lives in London but she was born in Japan. It has been many years since she left Japan and she has established a new life in England: She has a good job at a successful design firm and has a gallery show of her art, friends, and a good man she plans to marry. Things are going well for Yumiko until one day, her brother calls her with the news that their father has died. Still in a state of shock, Yumiko travels back to Tokyo. Upon her arrival she finds herself thrown back in a culture that has seemed so far away for so long. From the different rituals she and her family perform as part of her father’s funeral, to the motions she goes through from day to day as part of Japanese life, Yumiko begins to question where she really belongs — Japan or England. In addition, Yumiko must also find a way to deal with all of the things she has left unsaid and never shared with her father. 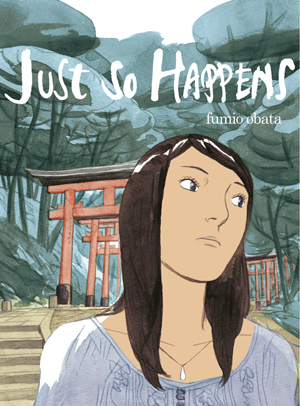 While “Just So Happens” is mostly a story about a young woman dealing with her father’s death, it also explores themes of identity and familial pressure as we discover how much courage it really took for Yumiko to move to London and pursue her dreams. Not only was she moving to another country — where she knew nobody — she was also moving away from her family to start a career they did not exactly approve. “Just So Happens” is a graphic novel with a complex story and Obata is able to tell it with a minimal use of words. The real story is in his artwork. From the devastation we see on Yumiko’s face when her father’s death finally hits her, to the scenes of a bustling London or peaceful Japanese pagoda, readers are able to get a true sense of Yumiko’s life as it stands. We feel her sadness, her confusion and her loneliness. In this first installment of Marvel’s “Ms. 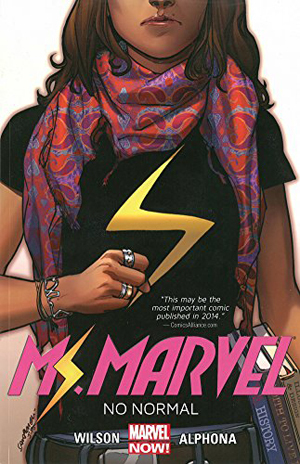 Marvel” reboot, we meet Kamala Khan, a 16-year-old Pakistani American girl from Jersey City who is obsessed with and idolizes Captain Marvel — the original Ms. Marvel, Carol Danvers. As this marks the beginning of Kamala’s adventures as a superheroine, we see how she first receives her superpowers: A weird and mysterious fog blankets her hometown one night and all of a sudden, she’s able to change her appearance and size. We also see Kamala’s first act of heroism as she saves one of her classmates from drowning. And while having superpowers may be cool, it doesn’t change the fact that Kamala is still a teenager dealing with teenage things: parents who don’t understand, a friend who has the potential to become more than a friend (although she doesn’t seem to realize that yet), peer pressure, and the like. On top of this, Kamala also faces ridicule from her classmates because of her Islamic faith. But while being a Muslim is a large part of Kamala’s life — she attends mosque with her family and friends — “No Normal” shows that her religion is just one part of her life. The Khan’s family’s relationship with Islam is not so different from the portrayals we have seen of Christian families. Although, Kamala’s older brother is particularly devout, it appears he uses that as an excuse to not look for a job. In a world — the superhero world — that has been historically dominated by white males, it was refreshing to see a protagonist who is neither white nor male. By choosing a young Pakistani American girl to be the new face of one of their most popular characters, Marvel is showing readers that anyone can be a superhero (or superheroine, in this case) and the hero of their own stories. The year is 1898, the country, China. A girl is born to a family, but because she is her mother’s fourth daughter, born on the fourth day of the fourth month, she is not given a name. After all, four is synonymous with death in Chinese culture. For the first eight years of her life, all she knows is that she was unwanted and is only known as Four-Girl. It isn’t until she discovers Christianity that she finds friendship and a name — Vibiana. “Saints” depicts the story of the Chinese Boxer Rebellion, which took place between 1899 and 1901. During this time, a group of Chinese people — the “Boxers” — came together to initiate an uprising against Westerners and in particular, the rise of Christianity in China. In “Saints,” we get a glimpse into this event in history through the eyes of a “secondary devil,” or a Chinese person who has converted to Christianity. For Vibiana, the church wasn’t so much turning her back on her Chinese heritage as it was finding a place to belong after her Chinese heritage turned its back on her. The Boxer Rebellion is an event in history I admittedly don’t know much about and that is probably not unusual among many people. 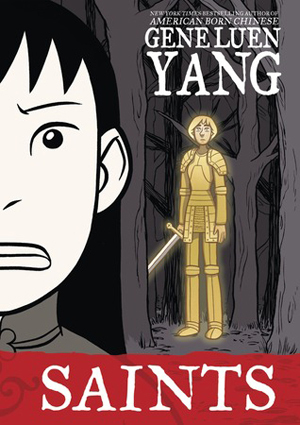 Yang introduces the subject to readers in a simple way—from the perspective of someone living it. And in the form of a graphic novel, we also get a visual of this point in history, making it more accessible to younger readers.